Methodist holiness advocates said their movement had started with John Wesley. They were just reminding Methodism of its founder’s teachings on entire sanctification or “perfect love"—the complete orientation of the heart toward God and away from sinning. During its post-Civil War “camp meeting phase,” the holiness revival spread quickly beyond Methodism’s bounds. In 1887, Presbyterian minister A. B. Simpson founded the non-Wesleyan Christian and Missionary Alliance (C&MA) on the teachings of Christ our Savior, Sanctifier, Healer (a common holiness theme by the 1890s), and Coming King. For many years, the C&MA held annual camp meetings at a former temperance campground in Old Orchard, Maine. Charles G. Finney and the Oberlin perfectionists (p. 22) were the earliest 19th-century non-Wesleyans who taught an attainable holiness. Hear the Gospel, exercise your will, and you could fulfill Jesus’ command: “Be ye perfect as your Father is perfect” (Matt. 5:48-. 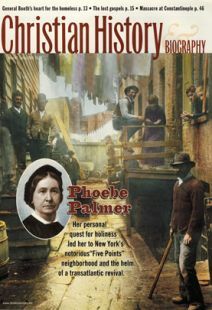 Oberlin perfectionists found the teachings of Phoebe Palmer and the Wesleyans ethically weak and sentimental. Harriet before . . . In 1877, Methodist holiness preacher John P. Brooks denounced the “easy, indulgent, accommodating, mammonized” kind of Methodism that “erected gorgeous and costly temples to gratify its pride.” Brooks wrote The Divine Church, the textbook for the “come-outers” who left their churches to form new denominations. Many holiness “come-outers” moved right through their new denominations and into the Pentecostal movement (p. 25). William Seymour, the black preacher whose Azusa Street Revival (1906) birthed Pentecostalism, had been an evangelist with Daniel S. Warner’s “Evening Light Saints” (p. 33). After Azusa, some holiness churches moved wholesale into Pentecostalism. The holiness campground at Ocean Grove, N.J., founded in 1869, became the most popular Christian resort on the East Coast. President Ulysses S. Grant was a frequent visitor. On August 25, 1899, William McKinley became the first president to speak in Ocean Grove’s 8,000-seat auditorium. He was followed by Presidents Theodore Roosevelt, William H. Taft, and Richard M. Nixon. In 1894 a group of Southern Methodist bishops wrote a letter sharply criticizing the Methodist holiness “party.” Methodism, they said, had never stopped being a holiness church. It needed no special agencies to press the point. By 1885, the national holiness movement had two distinct wings: a rural, emotional, ethically strict wing inclined to throw off churchly structure and an urban, intellectual, less rigorous wing eager to work with the mainstream churches who shared their concern for a “higher Christian life.” The “come-outers” emerged from the first group. Oswald Chambers, author of My Utmost for His Highest, was a holiness advocate. Sanctified in 1901 after an intense religious crisis, Oswald went on to visit many holiness camp meetings and teach at holiness schools (p. 25). I like their aim. They aim high. If they miss, nevertheless, they have scored one good point. They are against sin and wrong, including Sunday trains, secular newspapers, Sunday cooking, Sunday gossip, tobacco, and other uncleanness. They are Prohibitionists, almost to a man. They make and distribute tracts. They have a catching sort of degree of spirituality. They are in for everything that is good. They say "amen" out loud. They shout as I feel. They [root] for a fellow while he is preaching. If the load is heavy, they all jump out and push. Wherever you meet one, he is already organized and ready for work. If they are scared, they pray and shout, and work and move, so that it can't be detected. They always want to dig deeper, climb higher and know and do more. They are long-winded in the closet, and nearly out of breath in a testimony service. Every one of them will pray if you call on them, and if the fuse seems damp, they will pray, call or no call. They don't ask how many are the enemy, but where are they? They can shout in the cemetery. They actually use the Bible in their work. They will go to China or Africa as cheerfully as to the market. It is not a money question with them. They know the Holy Spirit. Their experience throws up a highway I'd like to die on. They are unpopular with dirt, dignity, and the devil. They are not in "ruts." They cry and run as if they had jumped the fox. That makes me spur on in the chase. Whenever I meet or hear one of them, it makes me want to quit something, or do something, or go somewhere, or be somebody. —Holiness Advocate, Fayetteville, N.C., Aug. 15, 1903. From fire on Mount Athos to Saxon king crosses. Did you know men slept on the Bridges?